*Please Note: These are the manufacturer specifications and may vary slightly in each production unit. 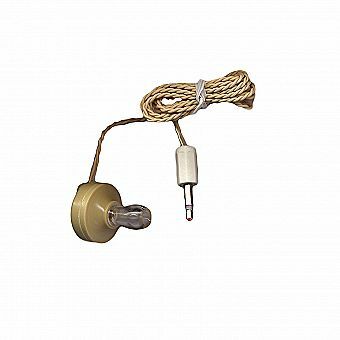 Ceramic earphone/Crystal earpiece for Transistor and Crystal Radios, Sensitive Electronics Projects, Lab research and other DIY experiments requiring a very sensitive high impedance earpiece. Piezoelectric earphones also known as crystal earphones, ceramic earphone, and piezo earpieces are the most sensitive earphones. They are in fact many times more sensitive than even the most sensitive magnetic earphones, dynamic earphones, or electrostatic earphones that you may use on your iPod or iPhone. Sensitive earphones have a very high impedance, which is measured in ohms and should not be used directly with a modern amplified radio. Crystal Earphones are so sensitive and require so little power to operate that you can hear a small 'click' just by touching the two bare leads together. Crystal radios will not work with modern earphones or 'earbuds' as they are designed to operate with amplified audio sources found in today's electronic devices. Crystal Earphones are used in the construction of the crystal radio and in some science experiments such as listening to electric fish.